Howdy! Here we have the summary version of this year's Howard Days schedule. 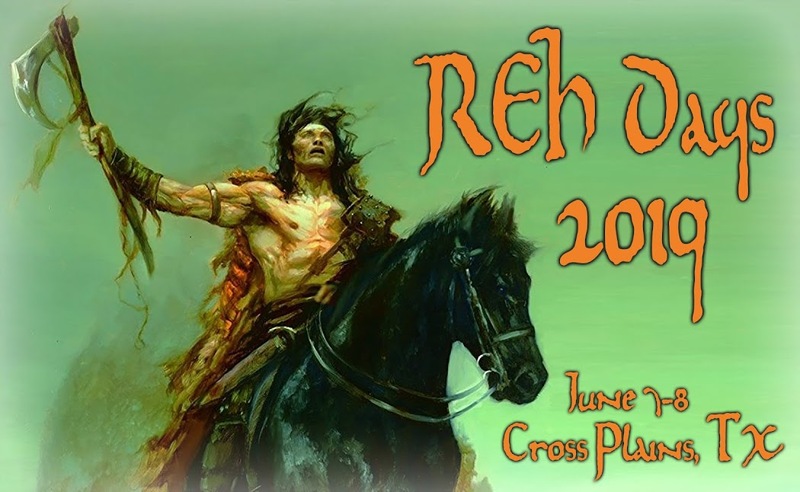 As you can see, it's a fun-packed weekend and you will experience REH overload on June 13th and 14th! We'll do some continuous posting here with the more detailed information as we get closer to June. You can always check out the complete info page at www.rehupa.com by clicking on the REH DAYS 2014 tab at the top of the page. Also, you can check the Howard Days Facebook page and several of the other REH Facebook sites for info & photos. It's time to make plans to be in Cross Plains for The Best Two Days in Howard Fandom! 9 am – 4 pm: Robert E. Howard House Museum open to the public. Noon: Lunch hosted by Project Pride. Donations welcome. 6:30: Robert E. Howard Celebration Banquet & Silent Auction at the Cross Plains Community Center. Afterward there will be some extemporaneous REH Porchlight Poetry reading directly from Bob's front porch! PLEASE NOTE: The Robert E. Howard House Museum will be open again this year on Thursday June 12th from 2-4 pm. No docents on duty but the Gift Shop is open. PLEASE NOTE: All panels at REH Days last about one hour and are held at the Library unless noted. PLEASE NOTE: You do not have to pre-register to partake of the weekend’s festivities. All are welcome to attend, visit the House and enjoy all of the activities free of charge. Project Pride likes to pre-register folks primarily to get a head count of how many will be attending the Banquet on Friday night and the BBQ on Saturday night. All the panels, tours, Swap Meet, Pavilion activities etc. are presented at no cost. Your registration fee covers coffee & donuts Friday morning, lunch at the Pavilion Friday noon, the Friday Banquet and the Saturday BBQ.